Habitat restoration projects have the power to protect California’s vibrant landscapes, water resources, and iconic species. Sustainable Conservation makes it easier for folks like Betsy, Kellyx, and Tim to carry out this time-sensitive work. Taking care of people and the planet comes naturally to Betsy Stapleton. During her career as a nurse practitioner, Betsy navigated the highly regulated medical field and translated complex information into human language to get her patients what they needed. 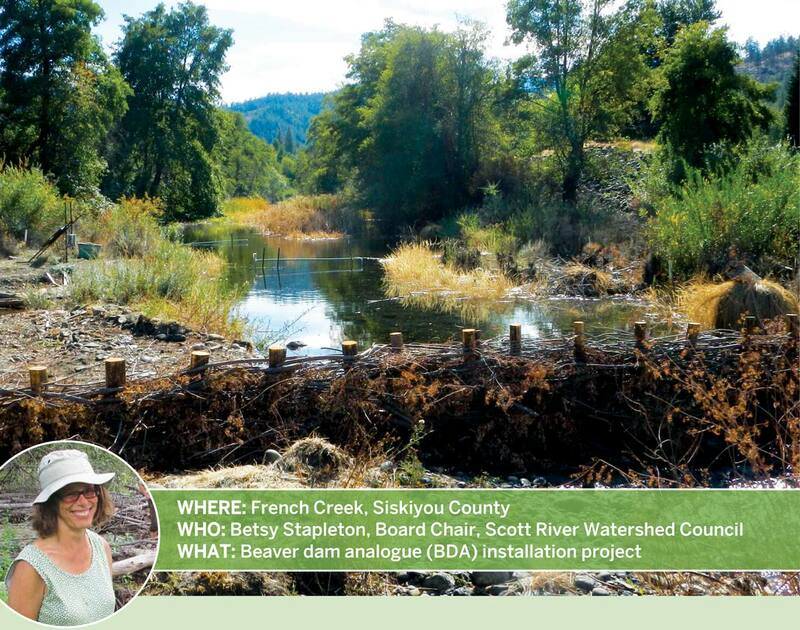 Those skills have transitioned beautifully to Betsy’s retirement “hobby” of leading habitat restoration projects up in Siskiyou County. Today, she focuses on improving the health of the land and waterways in her Klamath Basin community. That means identifying solutions that will work for local fish and wildlife and local landowners alike. It also means sorting out permitting to turn conservation ideas into reality. One of those solutions borrows an engineering technique from beavers. Betsy learned about this unique method from Dr. Michael Pollock of National Oceanic and Atmospheric Administration (NOAA) Fisheries, and partnered with him to bring it to California. Historically considered a nuisance and nearly hunted to extinction for their pelts, beavers curry favor today with their knack for managing water. The introduction of low-cost post-and-fiber lattice structures – known as “beaver dam analogues,” or BDAs – leverages water both in rivers to help recover dwindling populations of Coho salmon and steelhead, and on land to sustain the area’s farming economy and recharge aquifers. Thanks in part to a permitting tool Sustainable Conservation developed with the California Department of Fish and Wildlife, called the Habitat Restoration and Enhancement (HRE) Act, BDAs are catching on in Betsy’s rural, far-northern pocket of the Golden State – and providing a learning lab for folks from all over the U.S.
Beavers are busy for a reason! Building structures that mimic their dams redirects, slows down, and pools stream flows to create hospitable habitat for imperiled fish. This savvy system also helps flows and silt move up onto adjacent floodplains to enhance wetlands, replenish groundwater, and enrich soil. In 2017, Betsy employed the HRE Act to permit construction of six BDAs on French Creek, a tributary of the Scott River. First and foremost, we’re in the relationship business,” says Kellyx Nelson. Helming a local government entity that aids landowners in stewarding natural resources, Kellyx is a staunch believer in common ground to catalyze conservation. Sound familiar? 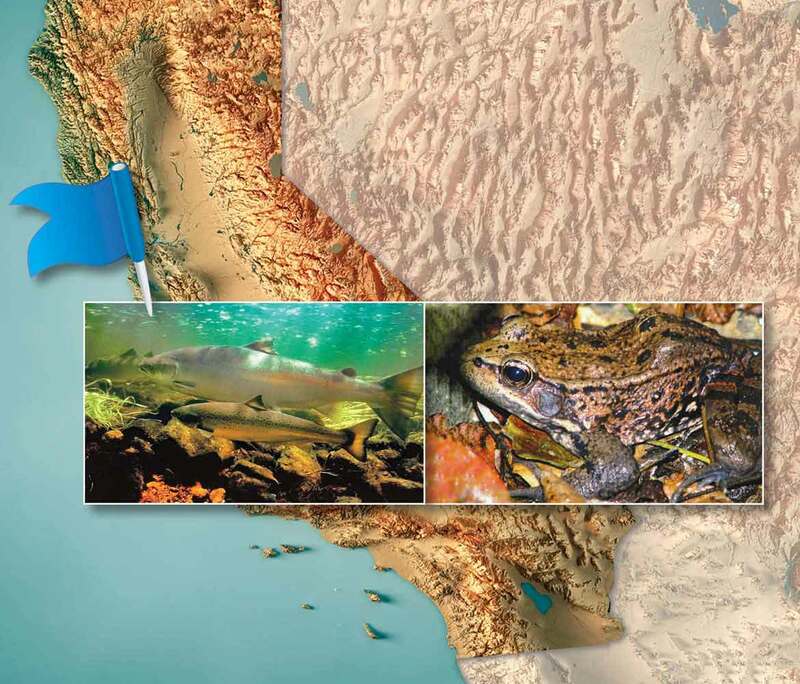 Resource Conservation Districts (RCDs) have long been treasured partners of Sustainable Conservation in accelerating restoration across California. We share a collaborative ethos, and Sustainable Conservation’s permitting tools are tailor-made for the types of projects RCDs carry out to serve people, nature, and agriculture. Healing our Golden State landscapes is of utmost importance to the more than 350 California species currently listed as threatened or endangered – as well as to our water and climate resiliency. For example, Coho salmon are on the brink of vanishing from Kellyx’s coastal district. A permitting program Sustainable Conservation helped broker between the California Coastal Commission and National Oceanic and Atmospheric Administration (NOAA) Restoration Center saves Kellyx and her staff oodles of time – an estimated one to two years per project that can now go toward reaping restoration work’s intended benefits. 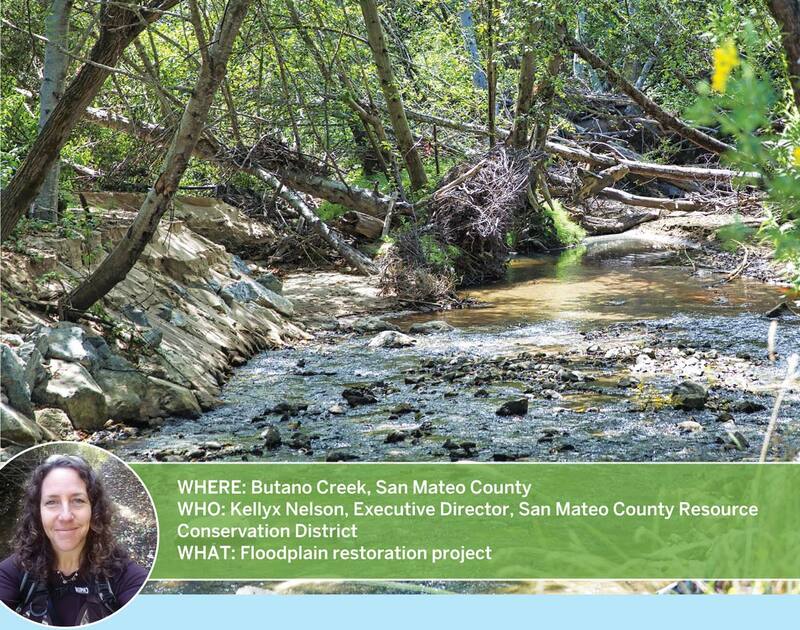 In 2016, Kellyx’s RCD utilized the program to partner with Peninsula Open Space Trust (POST) to reconnect Butano Creek with approximately 100 acres of floodplain and enhance creek function. By building up the deeply eroded creek bed and introducing boulders and logs at strategic points, water can slow to a more hospitable clip for local Coho and steelhead and scour refuge pools for both young and migrating adult fish. Water can also spill over the creek banks now, dropping out sediment that would otherwise sandblast fish eggs and juvenile fish. Recovered wetland once again hosts special critters like the California red-legged frog and rare San Francisco garter snake. Out on the land, creek flows help recharge groundwater. And, downstream, the floodplain restoration prevents 150,000 tons of sediment from inhibiting fish migration and causing flooding in the Pescadero community. For Kellyx, finding solutions to meet the complex, pressing needs of the environment and people is “heart work.” With committed folks like her in dialogue with the land and landowners, our Golden State’s vitals have hope yet. Bridge by bridge, Tim Robinson works to revive endangered Southern California steelhead. 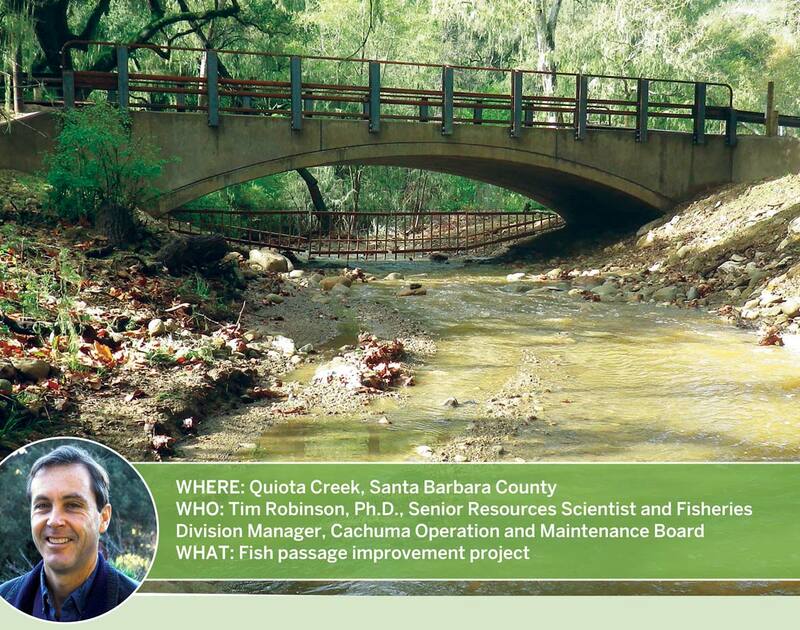 By removing fish passage barriers in the Santa Ynez River watershed, Tim and his colleagues contribute to the bigger picture of restoration and resulting ecosystem health for the area. On Quiota Creek, that means replacing small culverts that carry water under low-flow, concrete stream crossings with spacious bridges. Eleven of these road structures have historically impeded Quiota Creek migration by Southern California’s distinct population of steelhead, which has spent 20 years on the federal endangered species list. Bridges afford more room for stream passage, offering adult and juvenile steelhead access to precious spawning and rearing habitats within the creek – true lifelines to a species in trouble. These spanning installations also support local wildlife, including California red-legged frogs and Western pond turtles, in moving freely within a connected environment; help keep local roads from flooding; and provide safer passage for firefighting teams into Los Padres National Forest. Permit by permit, Tim‘s team negotiates the regulatory matrix to implement these vital restoration projects. Thanks to the Habitat Restoration and Enhancement (HRE) Act – Sustainable Conservation’s legislation that expedites the California Department of Fish and Wildlife’s permitting process – compromised creek crossings can be fixed more efficiently than ever. Tim has employed the HRE Act to advance three of eight Quiota Creek fish passage improvement projects to date, the latest of which will be constructed in the fall of 2018. Without a moment to spare, research findings tied to these projects spark hope for Southern California steelhead and their human advocates. Tim has been able to DNA-type fish to Quiota Creek – meaning the fish had matured in Quiota Creek, traveled to the ocean as a smolt, and returned to spawn in its natal stream. 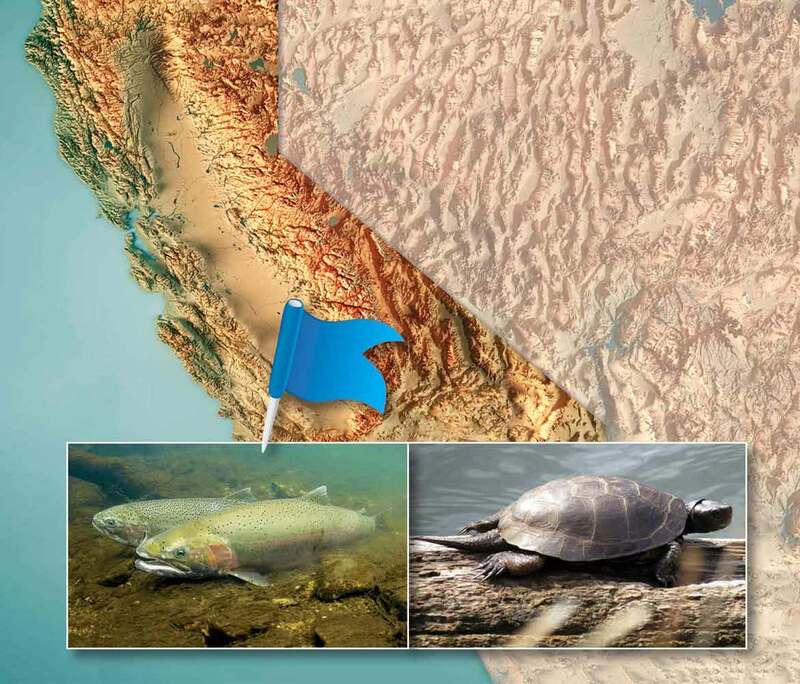 Knowing the anadromous gene – innate direction to head back up rivers from the sea to procreate – is alive and well in this tributary motivates Tim’s efforts on behalf of our Golden State’s endangered fish and wildlife. HEALTHY WATERWAYS offer robust migration corridors that enable wildlife to adapt to climbing temperatures and changing precipitation patterns. FLOODPLAINS provide room for rivers to spread out and slow down during volatile storm events, lessening the risk of flooding in downstream communities. In some locations, standing water can percolate down to recharge over-drafted aquifers. MEANDERING CHANNELS slow stream velocities, relieving pressure on riverbanks and levees that might otherwise breach and providing crucial aquatic habitat for a host of species in every region of the state. IN-STREAM LOGS AND STREAMBANK VEGETATION give fish cover from predators, form refuge pools, and decrease the likelihood of streams evaporating during dry periods. RIVER-ADJACENT FORESTS grow shade canopies that keep water from getting too hot for native fish and provide homes for songbirds, owls, and raptors. INCREASED AQUIFER STORAGE will help California meet future droughts. Underground caching keeps more water in-stream to support aquatic ecology while ensuring communities and farms have what they need to grow our food. Our Role: Sustainable Conservation advances policy and regulatory incentives, including partnering with state and federal agencies to simplify the permitting process, so more restoration can be done now in California – not years from now – to help our fish, wildlife, and communities thrive. We do this all while maintaining strict environmental standards. With your help, Sustainable Conservation has been bringing people together for over 25 years. Your legacy gift ensures that you and we can keep uniting people for environmental solutions that make economic sense. Creating a legacy gift to Sustainable Conservation can be as simple as signing your name, and might provide tax protection to your heirs. 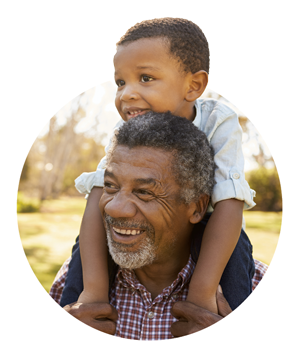 Click to learn more or contact Martha Henderson, Director of Development, or 415-977-0380 x305. All of our work is made possible by the generosity of our donors. Join us. To stay connected, sign up for e-news. Copyright © 2017 Sustainable Conservation. PHOTO CREDITS: SISKIYOU COUNTY – MAIN PROJECT PHOTO COURTESY OF BETSY STAPLETON, ADULT COHO SALMON AND JUVENILE STEELHEAD (MAP INSETS) BY NMFS/SOUTHWEST FISHERIES SCIENCE CENTER SALMON ECOLOGY TEAM. SAN MATEO COUNTY – MAIN PROJECT PHOTO BY U.S. 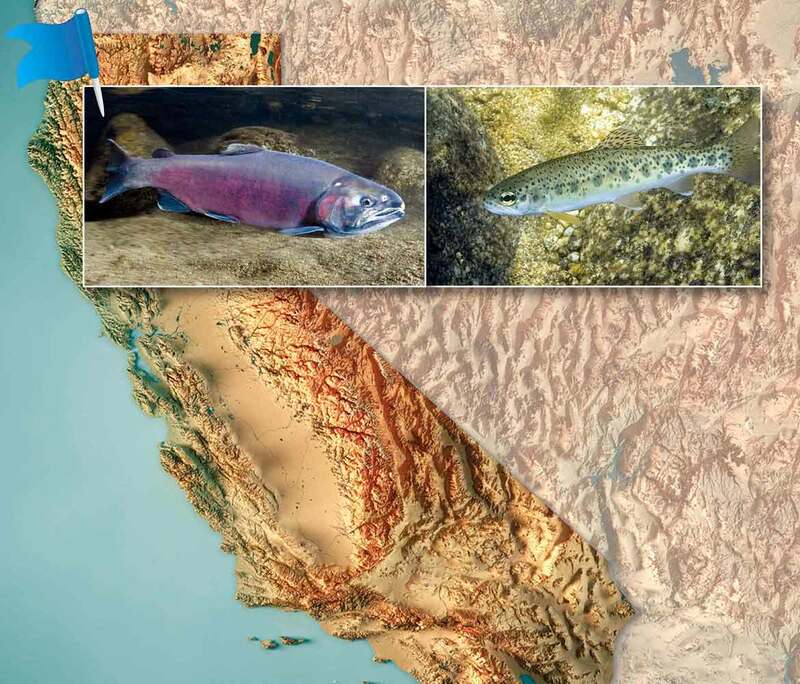 FISH AND WILDLIFE SERVICE/STEVE MARTARANO, ADULT COHO SALMON (LEFT MAP INSET) BY NMFS/SOUTHWEST FISHERIES SCIENCE CENTER, CALIFORNIA RED-LEGGED FROG (RIGHT MAP INSET) BY CALIFORNIA DEPARTMENT OF FISH AND WILDLIFE/DAVE FELIZ. SANTA BARBARA COUNTY – MAIN PROJECT PHOTO COURTESY OF TIM ROBINSON, STEELHEAD PAIR (LEFT MAP INSET) BY NMFS/SOUTHWEST FISHERIES SCIENCE CENTER SALMON ECOLOGY TEAM, WESTERN POND TURTLE (RIGHT MAP INSET) COURTESY OF ONE TAM.